« How Fit are You? Does it Matter? I recently read a blog on Artful RV Adventures where the author, Mark, addressed the subject of stuff and the idea that perhaps we have too much of it. Sometimes I think that I have too much stuff and wonder whether or not I need to rid myself of a lot of it. However, I haven’t reached a mindset yet that would allow me to chunk it, besides my wife wouldn’t let me throw her stuff away. An arguement can be made that most of us have things in our life that we don’t need and should let it go. 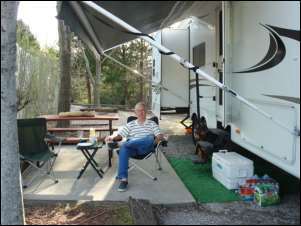 Mark’s blog centered around a couple who he met somewhere on his RV adventure. This couple has decided to take off on a five year quest for a more simple way of life by living the RV lifestyle without the RV. They are living out of the back of a Toyota truck with one of those topper shells and pulling a small covered utility trailer. Now that’s what I call getting down to the basics of life! Not many people would cut back that far, but in my RV travels I have seen a few people doing it. Mark and his wife have been on their fulltime RV adventure for over a year, enjoying the freedom of the open road and boondocking almost everywhere they go. They take beautiful pictures of the places they visit and post them daily on their blog, Artful RV Adventures. So what about my stuff? As I said, sometimes I think I have too much stuff. The more stuff that you have, the greater chance you have of something going wrong. For instance, one of the things in my stuff is a boat that we have owned over 10 years. It looks almost new since it is always under cover and I take care of my stuff. This summer I took the boat out for the first time in awhile and found that it wasn’t working right. Took it in for repair and had it fixed. Brought it home and then it wouldn’t start, which seemed strange since I had just brough it home from the repair shop. Took it back to the repair shop to find out that the two problems were totally unrelated. (Still seemed strange to me that it would break after just having broken.) Hundreds of dollars later, the boat was running across the lake when the speedometer went out. Bummer! While camping in Medina (after the boat repair) at The Farm Country RV Park, the black water dump valve on the camper broke, in the open position thankfully. We had to bring the camper home to have it worked on since I had no idea how to fix the dump valve. Dirty nasty job anyway! The valve was fixed and several weeks later we returned to Medina, set the camper up, turn the water on and tried to flush the comode. The operative word is “tried”. The flush valve broke! The next morning I had the local mobile RV guy, Winston, come out and fix the comode. I watched Winston fix it so next time I can do it myself. Everything went well for the next week until I decided to go to our deer lease in Rocksprings for the last time this season. I had a flat on the 4 wheeler trailer! A few days before we were to leave to come home, I noticed that there was a leak under the trailer at the point of the black tank repair. No leak allowed! Rather than leave the trailer in Medina as we typically do, we had to bring it back again. While I went to put the 4 wheelers in storage, in preparation for our departure, my wife tried to open the door of the camper and guess what, another malfunction! The door handle broke from medal fatigue. Maybe Mark and his friend are right…I have too much stuff. Perhaps we should sell everything, move into the back of the truck and head west. That ain’t happening! My wife wouldn’t let me sell the camper so after it is fixed again maybe we could head west on a quest of a simpler life without all of the stuff that just won’t quit breaking. There are lots and lots, big numbers, of people who have chosen to be fulltime campers. Perhaps some do it out of necessity, but I know many just want a simpler lifestyle without all that stuff that can complicate their lives. There are times that I envy people who have made that decision but may wife and I still want a place to come back to. We have children here and lots of grandchildren involved in activities and we want to be a part of their lives. So we will keep things as they are for now. We will travel in the camper as much as we can, enjoy the great outdoors as long as we can but still call this place home. This is where you are likely to find me while I’m home. My wife thinks I spend too much time here, but how could I blog and run my website This Old Campsite if I didn’t. This is where I spend my time when we are camping and I’m resting after a day of fun in the great outdoors. What a life!